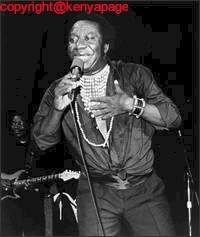 Tabu Ley Rochereau is indeed one of Africa's most accomplished Singer/songwriter. It is fair to say that aside from the legendary Franco Luambo Makiadi, Tabu Ley was the most accomplished African musician of the 20th century. But He will be remembered most for his creative drive and for his innovations which had a huge impact on Congolese as well as African music. He along with Dr Nico Kasanda is the inventor of Soukous , the dance mania that has swept the continent over the past two decades. He brought spectacle to the stage by introducing dancers clad in brilliant costumes to spice up his stages performances. This were later to be referred to as the Rochereaurettes. The Rochereaurettes wowed audiences across the globe during his concerts as the gyrated their bodies vigorously to Tabu Ley's vibe. He internationalized his music by fusing elements of Zairean(Congolese ) folk music with American soul , as well as Carribbean and Latin beats and instrumentation. He was born in Bandundu, Zaire in 1940. He was educated up to secondary school level which was quiet an achievement in an era where most Zairean adults were illiterate. He earned his nickname Rochereau from schoolmates and later adopted it as his artistic name. At age 14 He wrote his first song Bessama Muchacha which he recorded with Joseph Kabasselleh's L'Africa Jazz. Upon finishing high school he joined Africa Jazz as a full time musician. He sang the song Independence cha cha which was composed by Kabaselleh when Congo was declared an Independent nation. The song was adopted by several countries as the national anthem thus propelling Tabu Ley to instant fame. His first song with Africa Jazz , Kelia was a huge success.